Going down the stairs could be impossible at a house in Taipei which is being built upside-down. Like the result of a Nick Knowles Apocalypse Now-style fever dream, this fully realised house in the centre of the Taiwan capital really is a remarkable sight. Featuring everything from beds and bathtubs to even a car and bicycle in the nearby garage, the attention to detail is astonishing. Every single item is firmly attached to the ceiling in what must have been a painstaking process for those involved. Covering 334 square meters spread across three storeys, it’s part MC Escher, part IKEA catalogue and has attracted plenty of local interest. The builders claim the inspiration behind the house/art installation was to present an entirely new and very different view of the ordinary world. And is a bugger to negotiate when drunk. Those keen to explore inside must pay a whopping six Taiwanese dollars (13p) charge, but that hasn’t put anyone off yet. It’s attracted almost 1,000 visitors per day since it opened. 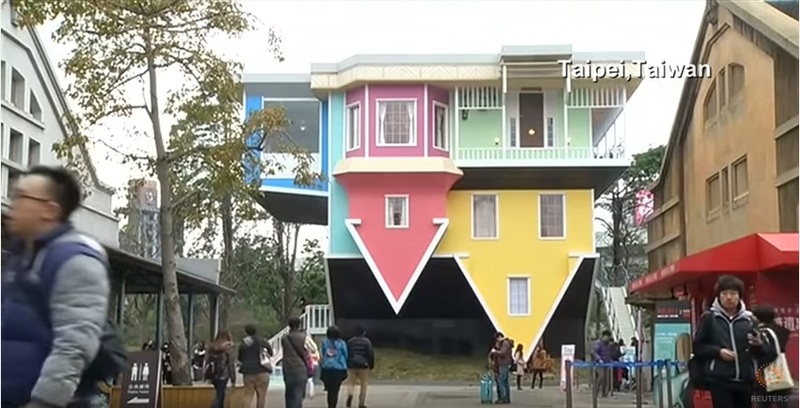 The upside down house Visitors have flocked to the Taipei property. Anyone seeking to purchase the property will only have to pay £12,880. So an offer could be incoming very soon. The house was originally a disused warehouse, and has since been turned into a showcase for local up and coming artists to show off their work. The artists can show off their work until July 22, when the Taiwan Cultural Creative Development Company hope to sell off their masterpiece. Whether or not the fake steaks, broccoli and sweetcorn glued on the upside-down plates in the kitchen will be part of the sale remains to be seen.